Looking through the window of a jewelry store, we know it’s more than what we see on the surface that makes the jewelry costly. There is a long and difficult journey hidden in the heart of each beautiful gemstone. It is the journey that creates the rare and unique qualities that make them so valuable. The discovery of learning your worth is not very different from that of a precious ruby. What is valuable in women is developed by time, heat, and pressure forming them into powerful and enduring gemstones. Like jewels, we are being cut, shaped, and polished to become who and what we are. Each of us has something beautiful about us, even if it is hidden. The challenge for many of us is our inability to recognize and define our own inner and outer beauty. beautiful gem, God formed you, then shaped and polished you, and has already prepared the path for your life. Where you find yourself is not an accident; it is God’s perfect plan. The circumstance of your birth has nothing to do with your destiny. 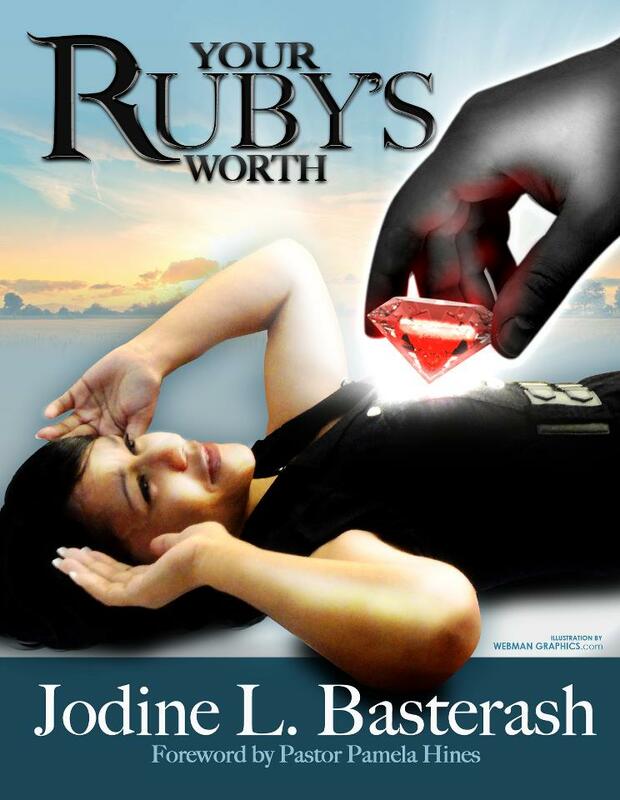 Jodine shares her personal journey as she discovered her Ruby’s Worth enduring time, heat, and pressure passing the tests of difficult times forming her into one of God's precious rubies. God has allowed the pressures of her painful past to bring to the surface the best of who she is. Her prayer is that this book will help you discover your uniqueness in God and locate the true person God created you to be and intends for you to become. No one can be you but you! You will not only restore the truly valuable things that have been lost, but perhaps will also gain what has never been! Discover the rare, original, magnificent, fabulous, beautiful person God designed you to be! You are one of a kind, irreplaceable, and valuable beyond measure. You truly are all that! original, magnificent, fabulous, beautiful person God designed you to be! You are one of a kind, irreplaceable, and valuable beyond measure. You truly are all that! Domestic violence doesn’t just happen “out there” somewhere. It happens in our city, in our neighborhood, and on our street. It happens to men and women we see at work, the grocery store, the movie theater, and the PTO board meeting. For too long, it has been like a hidden taboo where it is not discussed and society believes, "what goes on in our household, stays in our household. It's nobody's business." When in reality, DOMESTIC VIOLENCE IS YOUR BUSINESS! 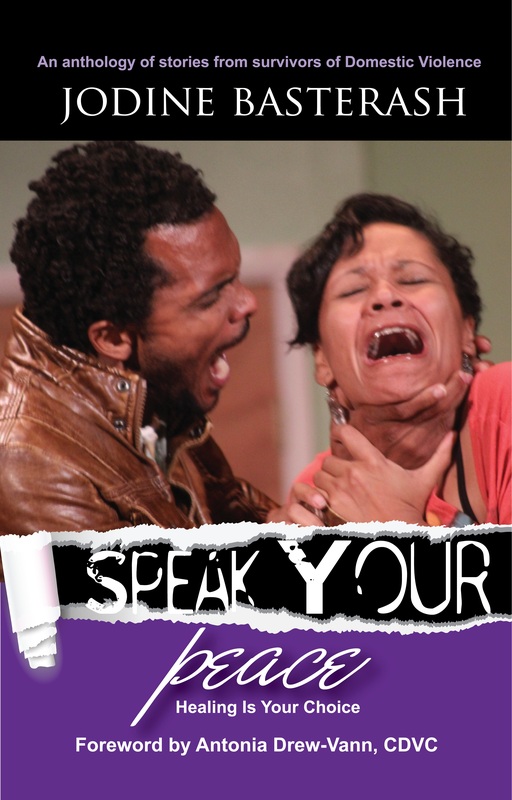 This special volume of Speak Your Peace will be the first of many as we enter the world of poetry and survivor testimonies regarding domestic violence. This series will involve a variety of people who have been affected by domestic violence and attack issues from a child to adulthood. The compilation of survivor stories are from those who have encountered domestic violence as a witness, victim or perpetrator. We hope that anyone who is dealing with this issue can find themselves in this book and find hope and healing. It is my wish to awaken anyone who will listen to the responsibility we all have to speak for those who do not have a voice. When you stand and share your story in an empowering way, your story will heal you and help someone else. It doesn't matter where you've been or what you've done, or what's happened to you. God has big plans for your life. He wants to make you a living testament of His power to the world. God saved you and has a purpose for your life. Each of us has something beautiful about us, even if it is hidden. Like jewels, we have different kinds of inner and outer beauty which come from within the stone that captures and reflects light. The challenge for many of us is our inability to recognize and define our own beauty, endurance, and rarity. My mission is to help others find their voice and remove the mask by giving them empowerment and support as they "speak their peace" sharing their story from being a Victim....to a SURVIVOR!